No one dare cross Transformers: Age of The Extinction. The latest entry in Michael Bay's Transformers franchise is tearing it up at the box office, pulling in an astounding $100 million on its opening weekend. Or possibly a little less if off-the-record comments can be believed. Regardless, Transformers: Age of The Extinction is expected to be a continued force at the theaters this weekend. Competing studios have seemed to clear a path. No major tent pole or action-spectacle will open against it. And now Paramount is upping its game by doling out free gifts to those who go to see Transformers 4. Collider reveals Paramount Pictures has teamed with AMC Theater and Regal Cinema to offer a special giveaway to Transformers: Age of The Extinction audiences. If you see this film at either theater chain on July 4th in IMAX 3D, you'll be given one of two limited edition Transformers: Age of The Extinction, while supplies last. So book your tickets now, and show up early. 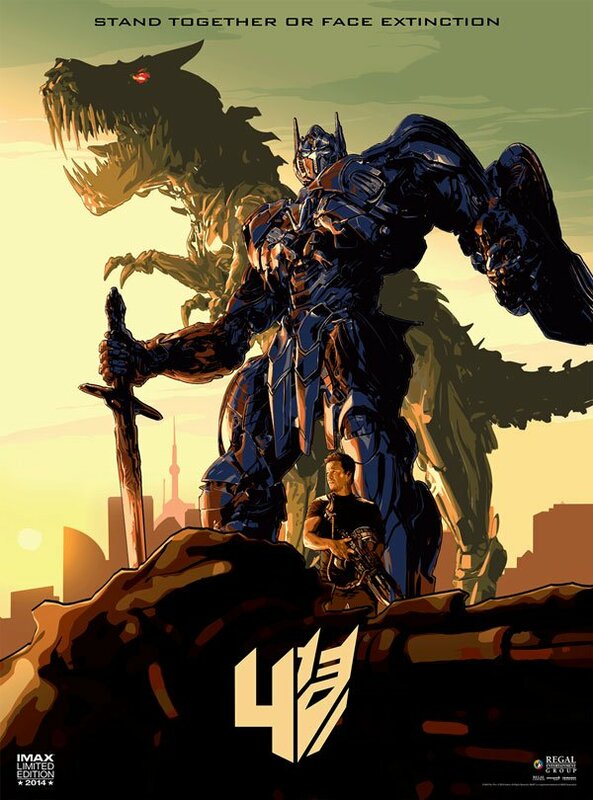 Each theater chain will have a different limited-edition Transformers: Age of The Extinction print. Collider doesn't specify the size of these posters, but you can see them both here. First, up top, is the print exclusive to Regal Cinemas. You can see this one features Optimus Prime in battle mode, with a snarling dinobot at his back and a gun-toting Mark Wahlberg at his feet. Above them hovers the simple theme of this overstuffed action adventure: "Stand together or face extinction." 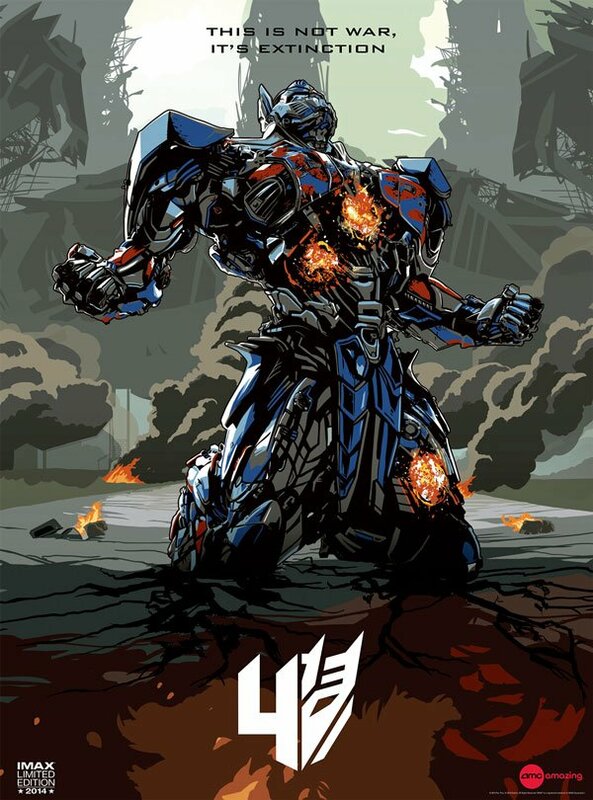 Note, that in place of the title Transformers: Age of The Extinction, this poster boasts a special Transformers 4 logo, along with tags to signify the poster's release and theater association. AMC must have lost the coin toss as their poster is decidedly less inspirational. Instead, of three different species standing together, this print shows Optimus Prime at a low point, battered, furious, and on fire. Above him looms the darker tagline "This is not war. It's extinction." Yikes. This holiday weekend Transformers: Age of The Extinction will face off against the Melissa McCarthy comedy Tammy, the horror thriller Deliver Us From Evil and the family-adventure From Earth to Echo. It's expected to do well, but the added oomph of IMAX 3D tickets sales just might assure this Transformers will top the box office once more.